The Lexus LS is a V8-powered, rear-wheel-drive luxury car that serves as the flagship of Toyota's luxury Lexus division. A length of over five meters (200 in.) gives the LS a "large car" classification in Europe as well as in the United States. According to reviews, the Lexus LS has one of the most silent cabins among modern cars and is sometimes hailed as one of the most refined, well-engineered, and technologically advanced vehicles in the high-end luxury car segment. As the LS' suspension is tuned primarily for ride comfort and isolation, the model is often accused of not being as sporty as German competitors such as the BMW 7 Series. The exterior features superb fit and finish and one of the lowest drag coefficients of any sedan on the market. The 2009 Frankfurt Motor Show will play host to the unveiling of the LS range's first mid-cycle facelift set to go on sale in the 2010 model year. For 2009, Lexus introduced the LS460 AWD at the 2008 Moscow Motor Show. The LS Series of sedans were completely redesigned for 2007. For the first time, the Lexus LS was offered in both standard and long wheelbase versions. Innovations on the latest LS sedans include the world's first eight-speed automatic transmission, real-time traffic updates, automatic parallel/reverse parking, and more luxury features than on previous models. 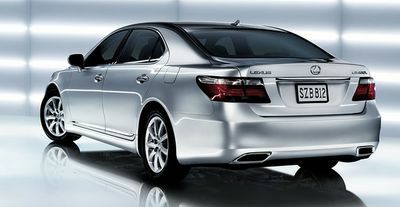 The LS Series of luxury flagship sedans went on sale worldwide in late 2006, furthering Lexus' efforts to establish itself as a global luxury brand. The long wheelbase Lexus LS 460 L in Black Sapphire Pearl. Lexus LS 460 and LS 460 L models. 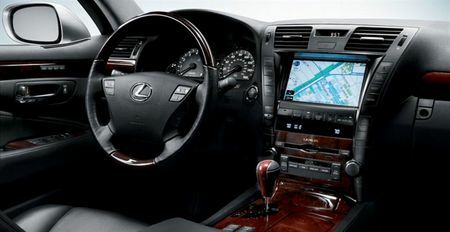 The Lexus LS 460's forward instrumentation and touchscreen navigation system. 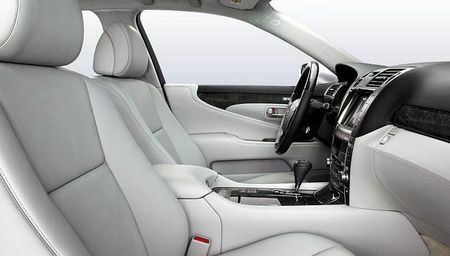 The luxurious forward cabin of the Lexus LS. 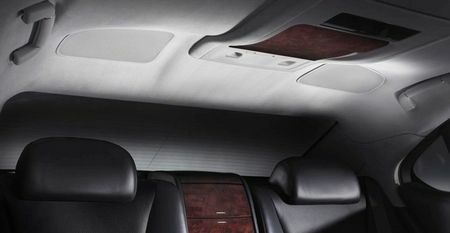 The LS' ceiling air diffusers and body temperature sensors are automotive climate control firsts. Today's actual prices for the Lexus LS 460 and the LS 460 L can be found at CarsDirect. The Lexus LS is considered one of the finest automobiles in the world, particularly in terms of reliability and build quality, generally regarded as excellent and surpassing all of its major rivals. The Lexus LS has also won many consecutive awards as a top vehicle in the J.D. Power surveys. The Lexus LS 460 L in Mercury Metallic. Design features on the LS include integrated rear exhaust vents and LED taillamps. 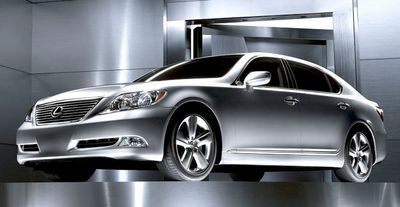 Lexus introduced the LS 600h L, the world's first V8-powered full hybrid, at the 2006 New York Auto Show. The LS 600h L uses a 5.0 L V8 engine mated to a high-output electric motor with Nickel-Metal Hydride battery packs to generate over 440 hp (328 kW). The LS 600h L will be available with an all-wheel drive system and a two-stage continuously variable (CVT) transmission. Lexus claims the LS hybrid is the most technologically advanced vehicle in the world, and predicts that the vehicle will be certified as a SULEV vehicle. Because of the silent nature of its hybrid design, the LS hybrid may be the quietest sedan in the world. More details such as curb weight and engine specifications are yet to be released. The LS hybrid will feature one of the world's first LED headlight systems, a leather-trimmed dash, and different exterior colors. Differently hued trunk "600h" and side chrome "hybrid" badges are also unique to the LS hybrids. U.S. base pricing is $104,000. 2010 Lexus LS 460 in Sport Package. 2008 Lexus LS 600h L in Black Sapphire Pearl. Introduced at the 2006 North American International Auto Show, a redesigned LS arrived for the 2007 model year. Based on the LF-Sh concept vehicle, the new LS features a 4.6 L V8 producing 380 hp (283 kW) and 370 ft•lbf (502 N•m), or a hybrid, V8. An 8-speed automatic transmission is the world's first. The car's complex electronic and safety systems have been shown in detail at the Geneva Motor Show in February, while the hybrid version had its debut at the New York Auto Show in April 2006. New high-tech options on the LS 460 include a 19-speaker "Reference Surround Sound System" with an 8 GB hard drive, front and rear climate-comfort seats, 4-zone climate control with air purifier, and a new automatic parking system. Lexus SmartAccess with a push-button starting feature, as well as the 8-speed automatic transmission, are both standard features. The 2007 LS marks the first time the car is sold under the Lexus marque in Japan; the Lexus brand was launched there in 2005 as part of Toyota's vision to make Lexus a "global luxury brand". For the first time, Lexus offers two wheelbases. The base LS 460 uses the shorter 116.9 in (2969 mm) wheelbase, while the gasoline engine is also offered as a long 121.7 in (3091 mm) wheelbase, the LS 460 L. The LS 460L also features an optional rear-seat comfort package. The package includes a reclining passenger's-side rear seat with massage features and an automatically operated footrest. An LCD screen is an available option for the rear seat compartment. Lexus introduced the LS 600h L as the world's first V8-powered full hybrid to the audience at the 2006 New York Auto Show. Introduced only in long-wheelbase form (it will be available in other parts of the world in both wheelbases), the LS 600h L uses a 5.0 L V8 engine mated to a high-output electric motor with Nickel-Metal Hydride battery packs to generate a total of 430 hp (321 kW), which is comparable to the BMW 760Li's 438 hp (327 kW) V12. The LS 600h L will be available with an all-wheel drive system and a two-stage continuously variable (CVT) transmission. Lexus is also predicting that the LS 600h will be certified as an SULEV vehicle. It claims the LS 600h is the most technologically advanced vehicle in the world. More details such as curb weight and price (speculated to be in the region of $90,000) are yet to be released. At the same time the hybrid model debuts, Lexus will offer its Advanced Precollision system, with such features as a driver monitoring camera (to sound an alarm if the system determines the driver's attention is needed), stereo video cameras, and millimeter radar for advanced obstacle detection, precrash braking, and lane keeping assist (not available on LS600h), which nudges the car back in line if it strays from its intended lane on the highway. The system will also feature rearward-facing radar to detect impending rear collisions and prime the active headrests so as to reduce injury to passengers. 2005 Lexus LS 430 in Mercury Metallic. For 2001, the UCF30 I LS 430 was introduced. While previous LS redesigns were evolutionary, the 2001 update was a more thorough update of the model's exterior and interior. The UCF30 had a completely redesigned suspension and a brand new 4.3 L engine, generating 290 hp (216 kW) and 320 ft•lbf (434 N•m) of torque. A three-inch wheelbase stretch resulted in more interior volume than the competing Mercedes-Benz S-Class and allowed the engine to be positioned farther rearward for better balance. Features such as Dynamic Laser Cruise Control, a DVD-based navigation system, and heated & cooled seats became available. 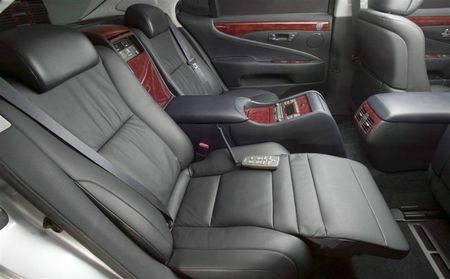 These and other features, such as sonar assisted parking, power rear seats with massage, and a rear cooler, were bundled in the "Ultra Luxury Package." In the interior, the most notable design changes included additional woodgrain trim on the dashboard and doors as well as the addition of an LCD screen on the center console. The exterior of the vehicle was completely new, with the vehicle's dimensions increasing in terms of length and height. The UCF30 II was introduced in 2004. Lexus freshened the front & rear fascias and added as standard equipment previously optional features, such as a one-touch power moonroof, power rear sunshade, and lighted rear-seat vanity mirrors. Some features previously included in the Custom and Ultra Luxury packages became available separately. The transmission got an added sixth gear, and keyless "smart access" and Bluetooth technology became optional, while a precollision system, similar to Mercedes-Benz's Pre-Safe, which used millimeter-wavelength radar to predict crashes and allow distance-aware cruise control, was added as an option. Other updates included different wheels, projector headlamps, and LED taillights. The 2001 to 2006 LS 430 was the most reliable luxury sedan in the J.D. Power and Associates Initial Quality survey, and the early and late models of this series were the most reliable cars in the survey. In later studies of defects after three years of ownership, the LS 430 is also at the top of the pack. 1995 Lexus LS 400 in Moonstone Pearl. Introduced in November 1994, the UCF20 I LS 400 was an evolutionary redesign of the LS and featured a new body that eliminated 300 lb from the previous car. The wheelbase was increased by 1.4 in., resulting in more interior and trunk space, yet the overall length of the car remained at 196.7 in. The durability of the brake system was improved as well. The most noticeable cosmetic upgrades included a new front fascia with an increased gap between the headlights and grille, new headlights, and new taillights. For the 1998 model year, the UCF20 II LS 400 was introduced. New interior amenities included retractable rear headrests, wood accents on the leather-bound steering wheel and gear selector, and a navigation system with concealed antenna. A new "jam protection system" for the vehicle's windows was designed to reduce the risk of possible injury by preventing the windows from closing if an object came between the window and the door frame. Door window controls were also added to the vehicle remote control. Exterior updates included new five-spoke wheels as well as redesigned rear view mirrors that reduced the amount of wind noise. The automatic headlights were now equipped with a delay feature that allows the headlights to remain on while the occupants exited the vehicle. The revised LS 400 featured Toyota's new 290 hp VVT-i UZ engine mated to a smooth five-speed automatic transmission. The drivetrain improvements not only enabled the 3,890-lb. sedan to accelerate from 0–60 mph in 6.5 seconds but also improved the vehicle's fuel economy. The original Lexus LS 400 in Diamond White Pearl. The UCF10 I LS 400 was produced from 1989 to 1994. The model introduced the Lexus nameplate to the U.S., and soon after won critical acclaim, becoming Wheels magazine's Car of the Year and earning a place on Car and Driver magazine's Ten Best list for 1990. The LS 400 was initially intended to be introduced as a standalone model for Lexus, but ultimately was sold alongside the ES 250, an entry-level luxury car that was based on the Toyota Camry. In Japan, where the Lexus brand was not established, the vehicle was sold as the Toyota Celsior. For the 1993 model year, the LS 400 (now designated as the UCF10 II) was introduced with larger brake rotors, standard passenger's-side front airbags, larger wheels and tires, and numerous other upgrades. For 2007, a gasoline-electric hybrid variant, the LS 600h L (see above) became available in the Lexus lineup. The LS 600h L is expected to boost the esteem of the Lexus LS; critics had pointed out the absence of a range-topping V12 as a significant omission in the Lexus lineup. The closest competitors to the LS 460, such as the Mercedes-Benz S-Class, offer range-topping S600 and S65 AMG sedans with powerful V12 engines and prices exceeding US$120,000. Critics' doubts on whether Lexus would be able to command more than a $12,000 premium over the LS 460 L were dispelled in spring 2007, when Lexus announced a $104,000 base MSRP for the LS600h, exceeding the $100K ultra-luxury segment mark. Rumors persist that a new and improved version of a Toyota V12, the 1GZ-FE (used in the Japanese Toyota Century) will be upgraded to more than 500 hp (currently 280 hp) for the European and North American markets to more successfully compete in the ultra-luxury segment with the Mercedes-Benz S600 and BMW 760, but nothing concrete has been confirmed by Toyota. The LS has received numerous awards since its introduction. The Lexus LS has won the J.D. Power award for the "Best High-end Luxury Sedan" 12 years in a row, the most for any manufacturer, due to vehicle dependability. The Lexus LS was the highest-ranked vehicle in the J.D. Power Initial Quality Survey for seven consecutive years, from 1997 to 2003. In 2004 and 2005, the Lexus LS 430 was second only to the Lexus SC 430 in the Initial Quality Survey. The LS 430 was again ranked in the top spot in 2006. In 2006, Consumer Reports awarded the Lexus LS as the highest-ranked vehicle in reliability in the luxury car class and gave it the "Best Car We Ever Tested" title, continuing the Lexus trend of scoring highly on Consumer Reports surveys. Based on Consumer Reports, a five-year-old Lexus LS is more reliable and dependable than a brand new BMW 7 series, Mercedes S-class, or Audi A8, owing to the wide disparity in reliability scores between the top-ranked LS and below-average German makes. The 2005 J.D. Power Vehicle Dependability Study found just 90 problems per 100 LS vehicles, the first time in the study's 16-year history for a vehicle to have less than one problem per vehicle. In 2006, the Lexus LS repeated this feat, averaging just 88 problems per 100 vehicles. 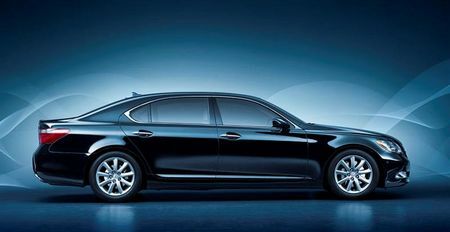 The Lexus LS 430 was named the Most Appealing Premium Luxury Car by J.D. Power in 2001. The second-generation LS 400 was also named Most Appealing Premium Luxury Car in 1996. In 1989, the Motoring Press Association of the U.S. named the LS 400 the Best Imported Car of the Year. The first-generation LS earned a place on Car and Driver magazine's Ten Best list and became Wheels magazine's Car of the Year. The 1991 LS 400 was named Best New Luxury Sedan and awarded the Car of the Year title at the Canadian Car of the Year awards, selected by the Automobile Journalists Association of Canada. The LS 400 was named the Best Import Car of 1993 by Robb Report. Automobile Magazine in 2005 listed the first Lexus LS 400 as one of the 24 Most Important Vehicles of the 20th Century, a title it bestowed on the vehicle in 1996. 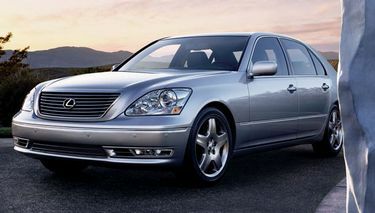 The LS 430 was judged as the "Finest Luxury Sedan in America" by Automotive Marketing Consultants, Inc. in a 2002 comparison test. Competing against ten other luxury models, including the Mercedes S500 and the BMW 750iL, the LS placed first in three out of seven categories: NVH, ergonomics, and utility. The LS 430 was also the quietest car in the comparison, with an idle reading of just 31.1 dB in the front seat. 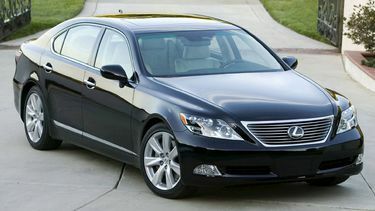 Car and Driver magazine awarded the 2004 LS 430 first place in a December 2003 comparison test of $70,000 luxury sedans. The LS 430 ranked above competing vehicles from Audi, BMW, Jaguar, Mercedes-Benz, and Volkswagen, with reviewers pointing to the LS 430's superior ride quality, highway performance, interior design, and technology as winning factors. Kiplinger's Personal Finance report named the Lexus LS 430 First in Class and Best in Safety for cars $40,000 and over in 2005. Intellichoice gave the Lexus LS its Best Overall Value award for the Luxury Class in 2004 and 2005. AutoPacific and Intellichoice gave the LS 430 the Motorist's Choice Award in the Cars category in 2006. Kelley Blue Book gave the LS 430 its Best to Hold Value Award in 2001, 2002, and 2003. R.L. Polk & Co., an automotive marketing research firm, gave the LS 430 its Polk Automotive Loyalty Award in the Prestige Luxury Car category in 2001, 2002, 2004, and 2005 for customer retention. Edmunds.com gave the LS 430 its Most Wanted Car award in the Large Luxury Class in 2002. The 2006 Lexus LS 430 won Best luxury sedan overall in the ConsumerSearch review of Best Luxury Cars on September 2006. Popular Science gave the LS 430 a Design & Engineering award in 2001, and named the LS 460 to its Best of What's New in Automotive Technology in December 2006. Popular Mechanics gave the LS 460 its 2007 Automotive Excellence Award in the Luxury category. The second-generation LS 400 was honored with Popular Mechanics' Design and Engineering Award in 1995. Automotive research firm TRG declared that the 2007 Lexus LS 460 offered the most technological features of any vehicle in the North American market, surpassing the newly launched Mercedes S-class and 2006 BMW 7 Series. Automotive data analysis firm Vincentric, LLC named the LS 460 L the "Best Value in America" in the Prestige Luxury segment in its 2007 Best Value Awards. Technology reviews site CNET.com named the Lexus LS 460 L the "Tech Car of the Year", the top prize of its Car Tech Awards 2006. The CNET.com editors recognized the Lexus LS for its sound system, navigation, NavTraffic, Bluetooth integration, and self-parking technology in naming it the most technologically advanced vehicle of the year. The fourth-generation Lexus LS was named the 2006–07 Car of the Year, Japan, taking the prestigious top prize among ten finalists in a competition juried by Japan's top automotive journalists. The LS 600h was named Limo of the Year in Top Gear's Car of the Year awards for 2006. 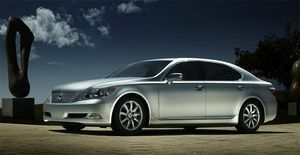 The LS 460 was crowned 2007 Car of the Year at the International Car of the Year (ICOTY) awards, held at the North American International Auto Show in January 2007. The LS 460 was named Luxury Car of the Year, beating out same-class competitors, named Most Respected, and in the overall competition, the Lexus LS won the top award, Car of the Year. The LS 460 was named World Car of the Year (WCOTY) at the New York International Auto Show's 2007 WCOTY Awards. The jurors found the LS to be the embodiment of the Lexus "pursuit of perfection" and recognized its innovative firsts, classical luxury with modern execution, and hybrid offerings. Antony Leung, the former secretary of finance of Hong Kong, purchased an LS 430 just before implementing a new tax that would have cost him an additional HK$50,000. The scandal, known as "Lexusgate", led to his resignation. The third season of the popular BBC television program Spooks featured a number of Lexus LS vehicles as part of the brand's introduction in the British market. The 2005 J.D. Power initial quality study found just 90 problems per 100 LS vehicles, the first time in the study's 16-year history for a vehicle to have less than one problem per vehicle. Bill Gates owned a 1990 LS 400 in burgundy and subsequently donated it to the Pacific Crest Outward Bound School in Portland, Oregon, in 1995. A Toyota Celsior is one of the cars driven in the racing arcade game and manga Wangan Midnight. The car, driven by Gen Sasaki (Gatchan), is often regarded as a joke due to the ricer features and Gatchan's reluctance to give his car more race features like removing excess weight and using garish bodykits. 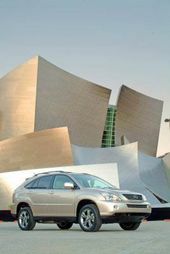 This page uses content from Wikipedia; see Lexus LS, which includes these contributors. This page was last edited on 18 October 2010, at 14:12.